Shopping around for a new set of SUMMER boots. I'm not REMOTELY interested in anything that claims to be waterproof - as that simply means warmer than necessary. I am looking for the most Protection along with the best Airflow and construction. Price is no object. It seems that very few are making Summer Airflow style boots with anything but synthetic materials (ie: no leather) and truly, the level of protection in these boots is VERY suspect. I'm willing to forgoe airflow in favor of protection, but that is a narrow margin of delineation. So, who's got a newer set of summer boots they wanna chat about that flows air and gives decent heal, ankle, and shin protection??? Shopping on Revzilla really only illicits a few brands, and they all look similarly constructed. 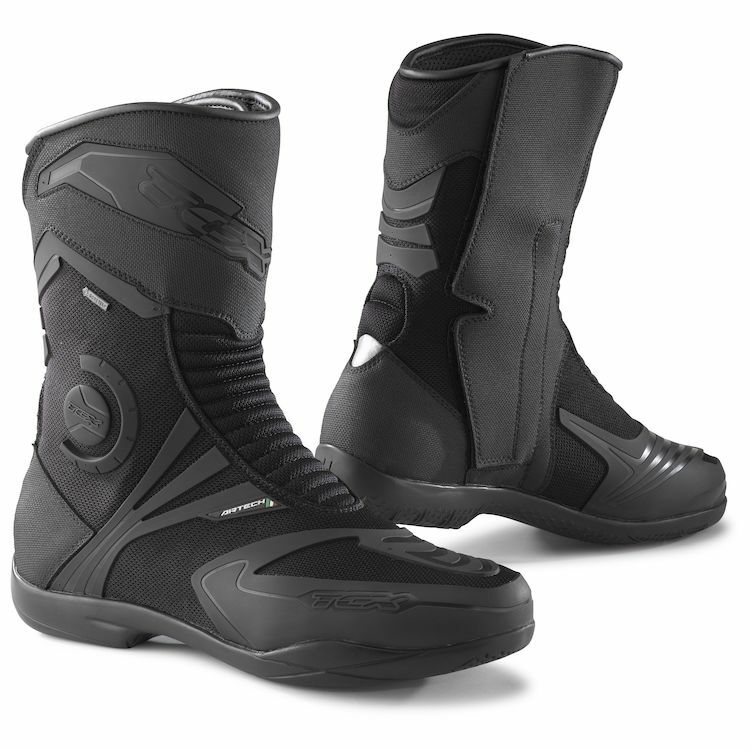 Currently my front runner is the Dainese Solarys boots. Re: Best SUMMER Touring Boots?? I bought a pair of the Dainese Solarys gore-tex version last year. These are the first pair of riding boots I've ever owned so not really anything to compare them to but, I really like them and like the protection they give me. I wanted the waterproof but they do get warm on really hot days. If the air Solarys are your front runner, I don't think you will be disappointed. I have a pair of the TCX airtech EVO Goretex boots. They keep my feet dry, and there are panels that are close to the skin that provides some air relief. You can really tell it in the cold weather, but not so much when it is hot. Just hot air blowing over your boots. i'm struggling with Venting vs. protection right now. There's really no such animal that provides max venting, max protection, and functional comfort in a Touring Boot. It's either SMX or Racing to get big protection, and Venting. After reading ALOT of reviews and getting limited responses on two forums.....I went with Alpinestars SMX 6 v2 Vented boots. Newer version of a tried and true boot, no waterproofing to restrict summer airflow, and protection just shy of Track Certified coverage. Price wasn't bad either. Seems kind of Ironic that summer ventilated boots all come in BLACK base color, and some white variants. Not really sure I'd want grey or silver boots, but you'd think there would be a reflective color option for a hot weather / sunny boot, right? Ghost man, I think the reason why black is the overwhelming color of boots and pants too is that they will get DIRTY and stains will more likely be seen, that's what I'm thinking. I've been searching for a lime green pair of Frogg-Togg pants like I had 15 years ago. I've got Alpinestars that I've been wearing for about 10 years. In the summer, I use wicking sock liners made for backpacking and thin wool (yep wool) boot socks. Keeps my feet fairly dry and not too hot.